Meet Peamikia'o. Can you recognize this turtle the next time you see it? This is Peamikia'o. "Pea" is the Hawaiian word for "bear" and "mikia'o" means "claw. Mr. Rice and his students at Hawaii Preparatory Academy (HPA) call this turtle "Bear Claw" so we did too. This image from SeaTurtleCam shows that Peamikia'o crawled up to bask on May 18th. Visit SeaTurtleCam and see if you can find this turtle basking during your visit. If you do recognize Peamikia'o, capture the image and send it to us along with the date and time you took it. We will then post your Peamikia'o Picture here for others to enjoy. We will be happy to give you credit too! This is an example of an interesting behaviour. Can you spot others? 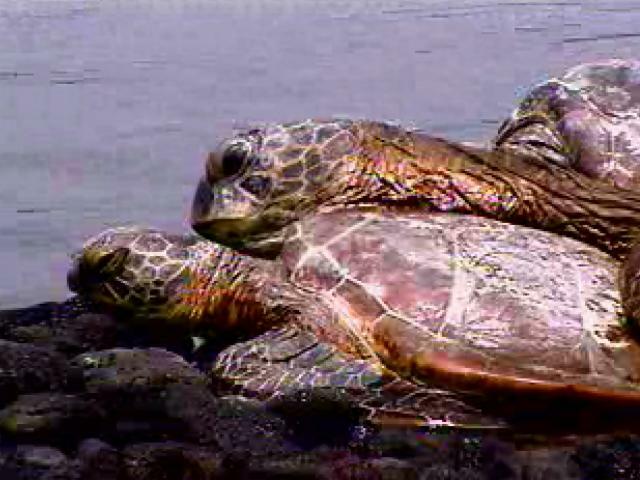 Here is a cool SeaTurtleCam image showing one turtle resting its flipper atop a much smaller honu. We find turtles like to do this underwater too. We also think this is an interesting and cool sea turtle behaviour! This is Pilikia putting her flipper over Howzit, a turtle we loved very much. Pilikia putting her flipper over Howzit, a turtle we loved very much. We think turtles like each other's company. Maybe scientists like George Balazs will prove that someday. If you "capture" an interesting behaviour while watching SeaTurtleCam, we encourage you to share it with us and let us post it here on Turtle Trax. 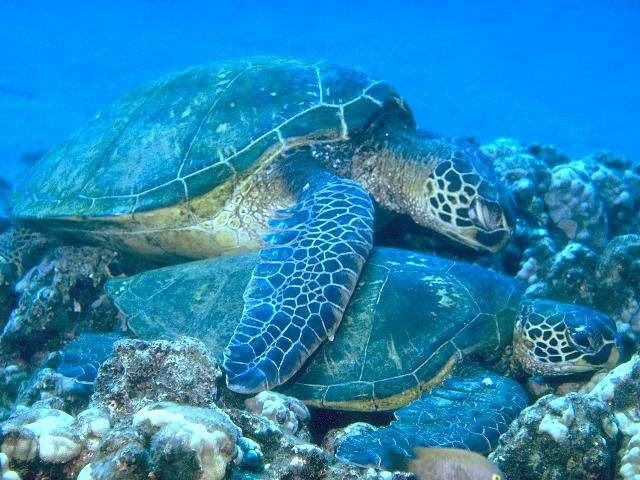 Hawaiian green turtles are beautiful gentle creatures. They are fascinating to watch. See what interesting behaviours you can observe while visiting the wonderful SeaTurtleCam. Visit the web site of the Hawaii-based Southwest Fisheries Center of the National Marine Fisheries Service. Learn more about how the Hawaiian SeaTurtleCam got started at Hawaii Preparatory Academy. 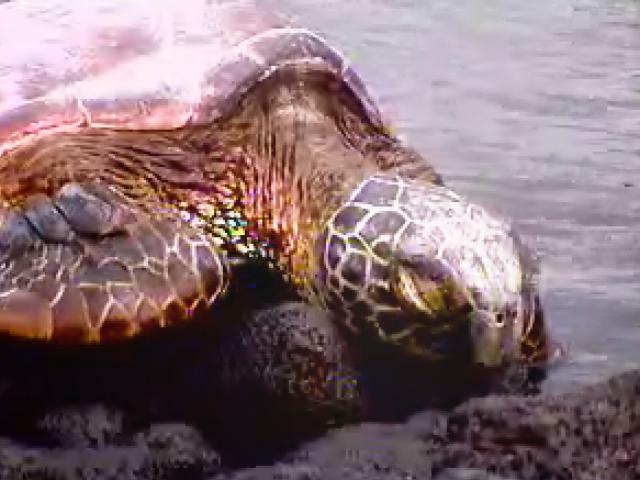 Read about George Balazs and his work with Hawaiian sea turtles. Discover how we use sea turtle faces to tell them apart. For fun, follow our comic strip and find out how sea turtles create their own webcam.